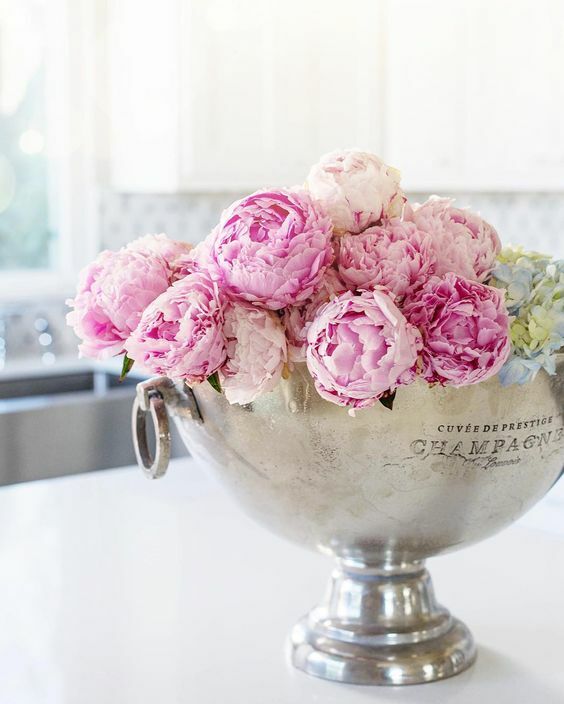 It seems like peonies are literally everyone’s favorite flower! And I’m not surprised. Because really, is there a prettier bloom out there?! Something about their fluffy beauty just makes my heart skip a beat! And I’m sure the fact that they are here for only a couple of weeks makes them that much sweeter. I wait for 50 weeks for them to appear and then buy them like crazy for two! 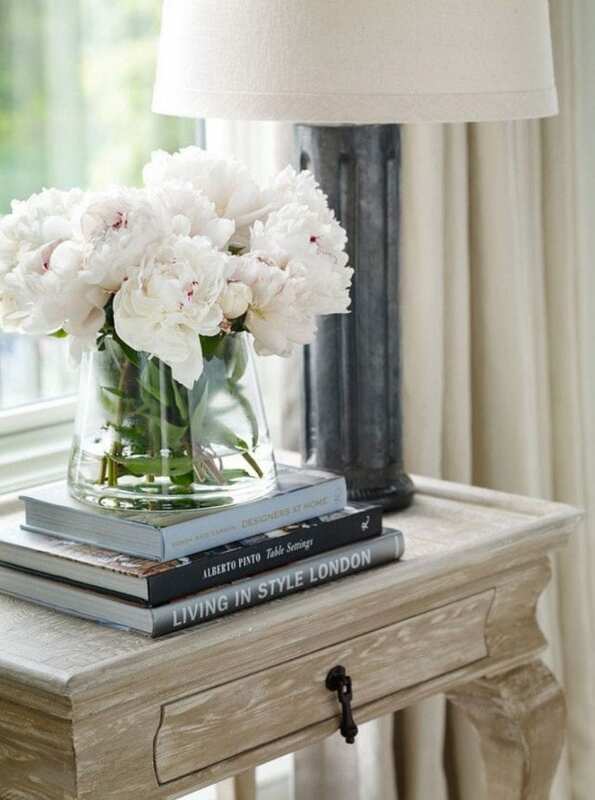 And peonies look amazing anywhere you put them! 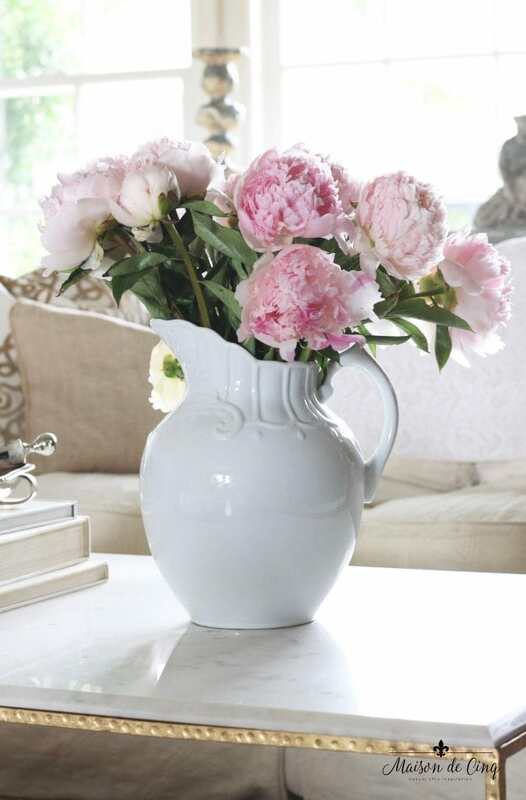 Whether it’s a glass vase, an urn, a pitcher, or even an old bucket, their beauty is unmatched. And they smell delicious, too! These were part of my summer tour last year. They look especially good in glass vases. So classic! 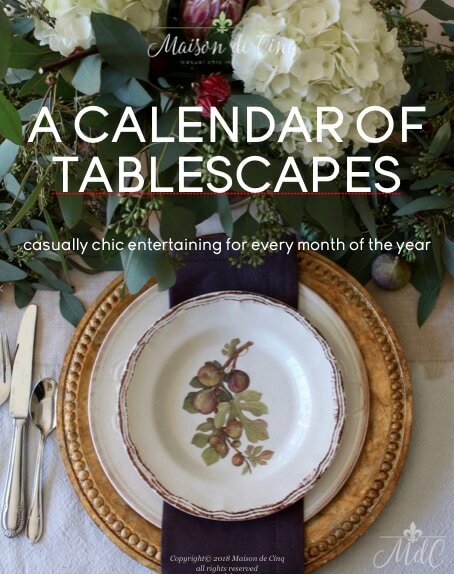 Via Ethan Allen. Pink seems to be the most popular color by far, but I also love the white, but I find them harder to find! Via Beth Webb Interiors. Stunning! Via Style Me Pretty. 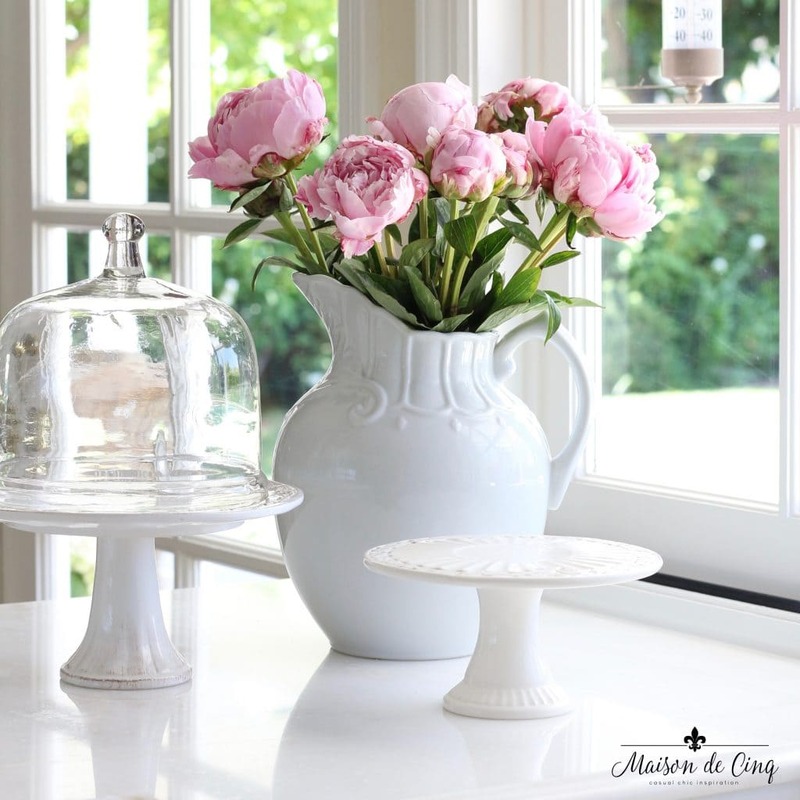 Since I have so much white ironstone, any flower that appears in my house usually ends up in it eventually! 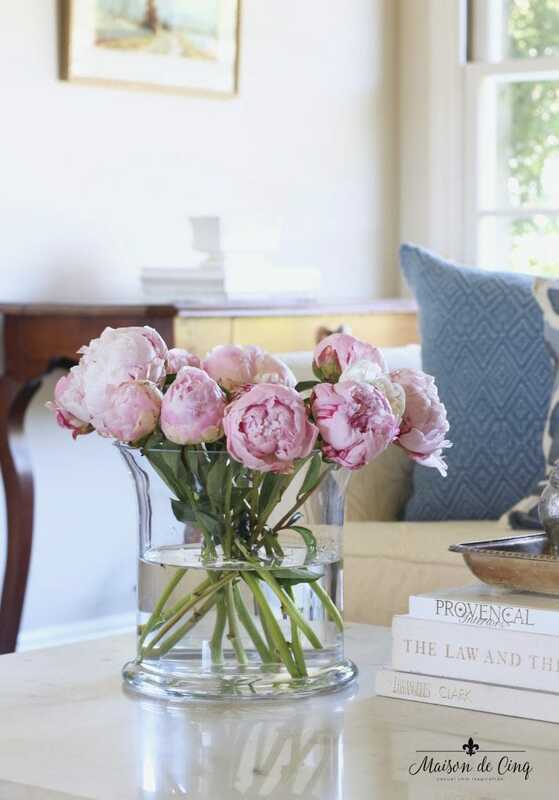 To get the most time out of your peonies, buy them in the bud stage. You can buy them when they are already blooming, but they won’t last nearly as long. Then, as soon as you get them home, clip them about 1/2″ to 1″ and plop them into whatever vessel you’re using with warm water and some flower food. Also, I usually clip them again in between and freshen the water every 2-3 days. Usually when you bring them home and their buds are closed, they will open right up as soon as you clip them and start blooming the same day. Then they explode! They get bigger and bigger and look more gorgeous each day. Another tip?! If you bring them home closed and want them to open faster, put them in warmer water and in a warm room. Likewise, to make them last longer you can put them in a cooler, darker spot like a garage to slow their opening. 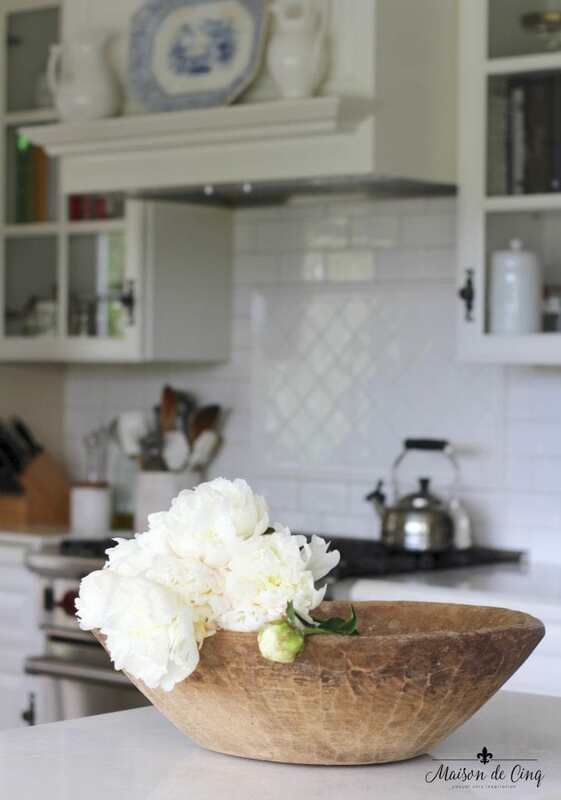 If you have the room, you can even put the whole vase in the refrigerator at night to really slow it down. This is especially helpful if you’ve bought them ahead for an occasion like a shower or dinner party, and you don’t want them to bloom too quickly. But I love them in every stage! The closed bud, the first opening flower, and the fully blooming beauties they become. If you clip often and change the water, they should last a good week or more in the vase. A little vignette on the kitchen counter last summer. I just adore them in this vintage French zinc pitcher. Via Dreamy Whites. Here I put them in my antique dough bowl. I actually nestled some water and florist’s foam in a small bowl inside so that they would last in here, and it worked! Personally, I love them in any vessel, but they look especially good in glass vases or something vintage. There’s nothing like a crusty old bucket or something funky to contrast with their charm. So if you’re inspired to run to the store (today!) and pick some up, here are some ideas for something to put them in. Also, don’t forget to check out my post all about flowers!! 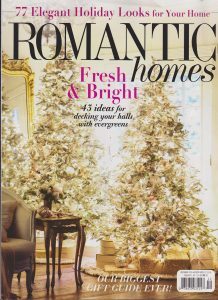 With ideas on styling – and budget! 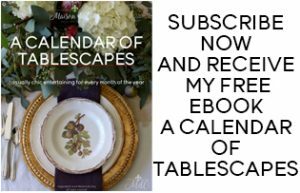 – check out my post How to Decorate with Flowers: 7 Easy & Stylish Tips! I am able to grow peonies here in Idaho and I love them! When I cut them I find if I fill my farmsink with water and let them soak underwater for a few minutes many of the ants will float to the top and I can dish them out. There are usually a few stragglers but it is much better than normal. I hope this helps someone. 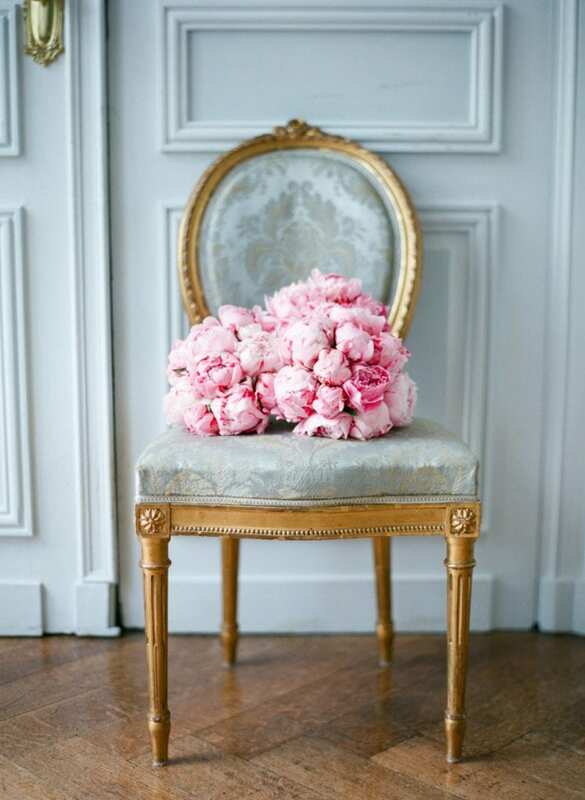 Peonies are absolutely beautiful! Does anyone know though how to get rid of the ants that open up the blossoms before bringing them into the house? I love fresh flowers but don’t want the ant issue inside. Any suggestions for home grown? Gosh Karen I am so sorry but I don’t. They don’t grow well in CA so I don’t grow them – I sure wish I could! I would try googling that or go to gardenweb.com. They always have lots of gardening info! I have 3 peony bushes in my yard. The buds are just waiting to pop!! Oh you’re so lucky – I wish I could grow them here!! 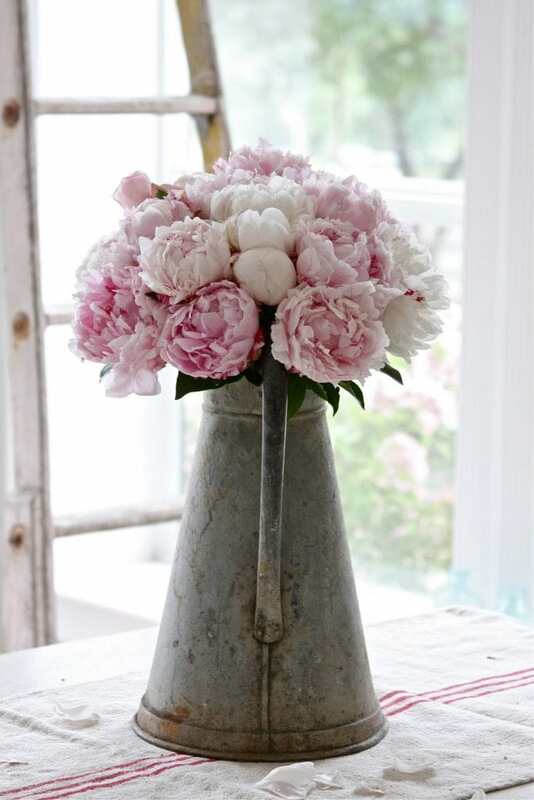 Thank you for the tips and tricks for cut peonies Sheila – I especially like the hot pink flowers that I have been seeing around town and love the mix of pale to vibrant pinks! Me too Michelle! 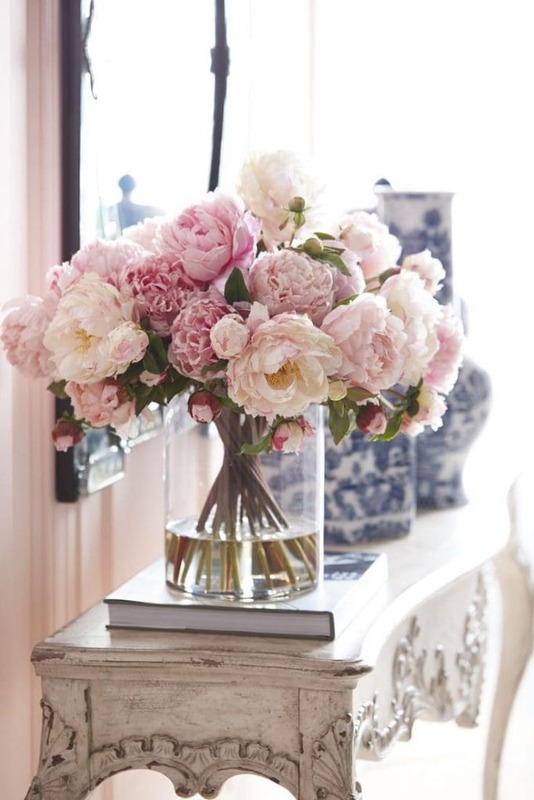 I’m usually a “white flowers” only person, but with peonies, I just adore all the pinks! Thanks so much for stopping by, I so appreciate it! Well they are certainly my favorite flower!! I wish their season lasted much longer! I live in CA too and have two plants that are in the one shady spot in my garden… they don’t grow as well as they did when in lived in Washington but they do grow! Thank you for sharing so many fabulous pictures! That’s so great that you have some, I didn’t think they grew here at all! Maybe I’ll have to try next year and see if I can get some to grow! Thanks for stopping by Angelina, and Happy Weekend! Every year I say I am going to plant them in my yard and then I forget! They are such a gorgeous flower…and you shared some beautiful examples of how to arrange them. Enjoy your weekend, Sheila! Oh, if I could grow them I would fill my whole yard with them! Unfortunately, we don’t have the right climate in CA for them. Which is probably why I treasure them that much more!